This is a joint giveaway with Mommying My Way and Natural Parents Network. You may enter at one site only. Please find the section marked “Win it!” for the mandatory entry and optional bonus entries. Super Skivvies is offering our readers a giveaway of a Try it Pack, a value of $54. Super Skivvies are the original convertible cloth training pants that come complete with inserts. 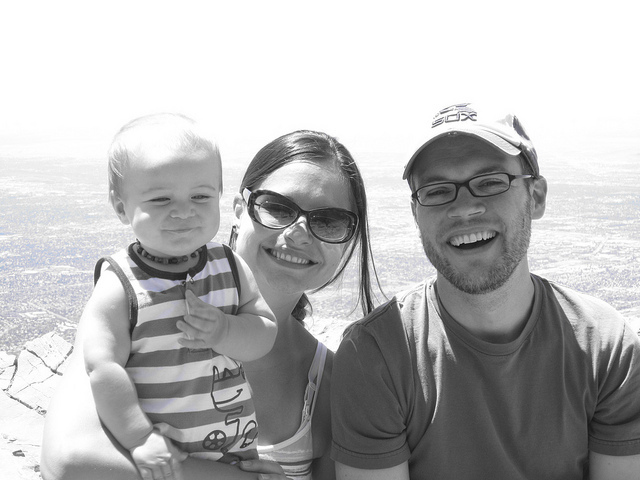 We started elimination communication when our son was eight months old. By ten months, he was reliable enough to not wear diapers as much, so I began looking into a cloth training pants option. I had never heard of Super Skivvies, but a simple search on Etsy for cloth trainers led me straight to this amazing product. I saw that they had a couple pairs of “seconds” (a product with some sort of flaw), in this case the tag was not sewn on the center in the back, but rather off to the side a bit, and I ordered them. We were so excited when we got our Skivvies in the mail just a few days later! I put the Skivvies on him and man, it was just way too cute. 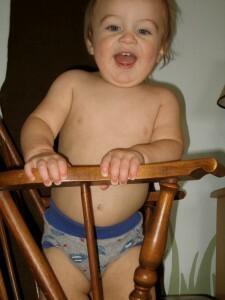 He couldn’t even stand up, yet he was rocking those Skivvies. The snug fit on the legs is also very soft and comfortable. They have a nice, thick waistband that gives a good snug fit, and the leg holes fit nicely too, so nothing leaks out. When he did have a miss and went in the Skivvies, the protective layer absorbed it all and nothing soaked through to his clothes. He can be very mobile without leaking. The pair shown here have been washed many, many times. They're still as good as new! They have pilled a tiny bit over the past seven months, but they still absorb fine and fit great. You can see above how the protective layer encompasses a padded insert. You can buy more inserts too, for extra absorbency if you have a heavy wetter. Then, once your little one is fully potty-independent, you take out the insert and they are just regular undies! He loves the Skivvies and the soft fabric is great for helping his booty dry and air out while holding in any leaks. He becomes much more active when wearing them as well, so I know he must find them much more comfy than a diaper. You can even buy packs of Skivvies for a discounted price. They have an outlet store on Etsy where you can find some Skivvies for a little bit cheaper than on the website. There are so many adorable patterns and they are available in small sizes, which is what attracted me to them in the first place. Steph Evans is the mastermind behind Super Skivvies. She is mom to a four-year-old little girl, she is a nanny by day and seamstress by night. The customer service at this Seattle-based business is unbelievable. Steph is always quick to answer questions via email or Etsy conversations. One time, a friend of mine gave me some super inserts as a gift, but they were the wrong size. I asked Steph what I should do, and it was so easy – I just sent them to her, she sent me the right size, and refunded me the shipping costs! You can buy your own Super Skivvies at their website and their Etsy outlet store. If you “like” them on Facebook, you will see many options for discount codes as well, including their daily coupon code! Or, check out below how you can enter to win a pair for your little potty-learner! 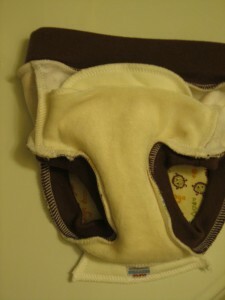 And just for Natural Parents Network and Mommying My Way readers, Super Skivvies is giving a 20% discount on all orders from now through May 5, 2012. Enter code NPNMAMA during the ordering process. You can also buy the inserts for $4.95. Super Skivvies come in sizes XS, S, M, and L.
For your own chance to win a Try It Pack from Super Skivvies, enter by leaving a comment and using our Rafflecopter system below. The winner will receive a Try It Pack valued at $54 Contest is open WORLDWIDE. MANDATORY ENTRY: Visit Super Skivvies and tell us which print you’d choose if you won! You must enter your name and email address in the Rafflecopter entry system for your entry to count, after leaving a comment on this blog post. This is a joint giveaway with Mommying My Way and Natural Parents Network. You may enter at one site only, and we’ll be recording IP addresses to ensure that there are no duplicate entries. That said, please do visit and enjoy both sites! Contest closes 5/5/12 at 11:59 p.m. Eastern Time. AUTHOR BIO: Adrienne is a first time mom to her mellow sweetie-pie, Burkley. Carrying her natural lifestyle over into her role of mother was a common-sense transition for this former elementary school teacher turned crunchy-mama. You can find Adrienne over at Mommying My Way. I like the MD White Pinstripe. Also like the LG Mock Bambi. Adorable! I would probably order the Medium White Pinstripe ones. I like the boys rock print. The Road Signs and Electric Storm are both cute. The Super Skivvies Boxer Briefs coming out this spring are nice, too. I’d get the x-small Road signs skivvies. I also like the extra soaker pads available. I like the Camo Skulls. I would also get the extra inserts. Really like the mock Bambi print as well as the Humpty Dumpty print. 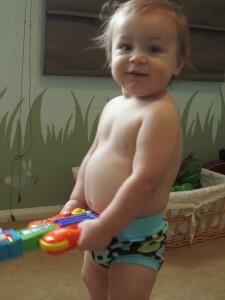 I would try the cloth training pants with humpty dumpty- too cute! I like the not listening design. My favorite is the LG Mock Bambi print – Super cute! I also love the LG Hooties print. My son loves owls and making noises like them so he’d love that pair! I would get the Ooga Booga print!